One of the five pillars of Islam is to keep the fast during the month of Ramadan. As a religious observance, the fast is a particular time period during which people refrain from doing certain things. To put it another way, the fast is an act of devotion, observed by not eating or drinking from dawn to dish, and refraining from sexual relations. It was instituted during the second year after the flight from Medina. 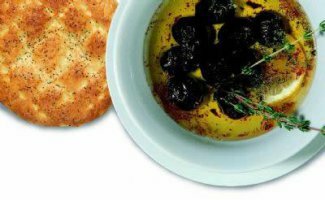 A significant portion of our culinary culture which has developed around Ramadan has to do with preparation for the month. 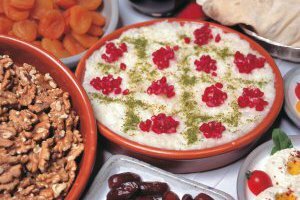 In Ramadan of old when, unlike today, every sort of fruit, vegetable and dried goods were not found throughout the year, foods and ingredients that would be consumed during Ramadan were prepared or bought during the seasons when they were cheap and plentiful. 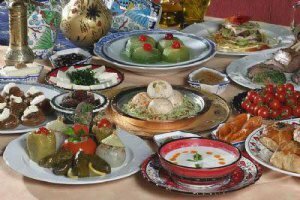 The foods that were bought or prepared ahead in large quantities and known as ramazanlık or ramazaniyelik were of special importance when Ramadan fell during the winter months. Some foods bought for Ramadan which indicate the richness of our cuisine include pastırma, sucuk, kavruma and other meat products, dried green beans, eggplant and red peppers, various pickles, cheese and oils, soup ingredients, especially tarhana, preserves, marmalades and fruit leathers, ingredients for compotes such as sour cherries, apricots, plums etc., bulgur, noodles, rice and pasta, tomato and pepper pastes, dried yufka and other breads. It was important that such foods be bought or prepared in quantities sufficient to last at least a month. Ingredients such as flour, oil and sugar, which at other times were bought weekly or daily, would be bought in large bags or tins to last throughout Ramadan. In some areas, this is known as ramazan tedariki, or Ramadan procurement. The month of Ramadan was of great importance throughout the entire Islamic world and in the Ottoman Empire. Preparations and purchasing began two or three months ahead of time. 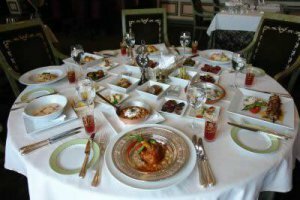 The people bought household goods/needs in quantities higher than during other times, including, according to their means, preserves, sucuk or pastırma, olives, cheeses, sweets for sherbets, syrups, sufficient sugar and dried fruits for compotes, güllaç sheets, soup ingredients. In addition, they had all such copper utensils such as frying pans, pots and sinis resurfaced with tin, and aired and fluffed the cotton and wool stuffing of beds and comforters. They made clothes for themselves and their servants to wear during Ramadan, and some of the better off even bought new room furnishings. 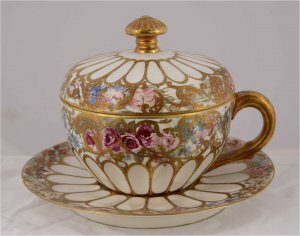 Everyone who could would, according to their means, buy fine coffee receptacles and cups, water glasses, expensive spoons, special spoons with whistles in the handles for the enjoyment of the children, and had clothes made. 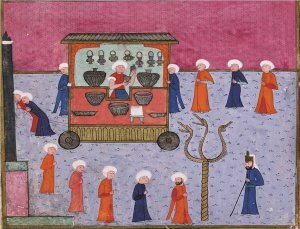 In the markets and bazaars, the grocers stocked colorful bundles of güllaç leaves, hung pastırma and strings of sucuk, and displayed all manner of household goods. In the sweet shops, samples of various preserves were laid out on small saucers, and were decked with sweets, ingredients for sherbets and sherbet cups known as haması. Tobacconists chopped âlâ Boğça, Yenice and Samsun tobaccos and packaged them up in all manner of fine papers. All the neighborhood coffeehouses were swept, their windows were cleaned and the Karagöz (shadow play) performers and orta oyun theatre (a type of traditional Turkish theater) companies rented the large coffeehouses throughout Istanbul in which to perform their arts. On one side were spices to put in soups. Incenses to burn while the Holy Koran is read, bottles, plugged with cotton, containing mustard to be eaten with the dish known as bumbar (stuffed intestine), dates to break the fast at iftar, and all sorts of spiced candies. And outside the glass doors, all sorts of simits, çöreks and Ramazan pide (special breads for Ramadan). Those who are well off followed the custom of sending Ramadan provisions to relatives, friends and neighbors. 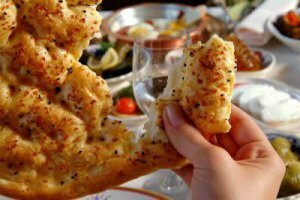 Today’s custom of factory/business owners distributing ramazanlık to their employees can be considered an extension of that old custom. As a result of the many developments in our country in the areas of agriculture, almost every fruit and vegetable is now available year round. We believe that because of this, the preparations for Ramadan will soon be left as a nostalgic memory. The meal eaten befor the break of dawn (fecr-i sâdık) by those intent on keeping the fast is called sahur. Sahur, called the “blessed meal” by our Prophet, is the beginning of the day of fasting. The eating of sahur by one who will fast is not a religious requirement but is recommended, is it will provide him or her strength throughout the day. Thus the sahur meal is recommended in a Hathith (İbn Maja, Saum 22). It is also recommended not to eat the sahur meal too early. But all eating and drinking must obviously be finished before dawn, as the dawn marks the beginning of the fast. As one will go back to sleep after sahur, the foods must be chosen with care. In addition to flavor and beauty in appearance, it is absolutely necessary that sahur foods be healthy. 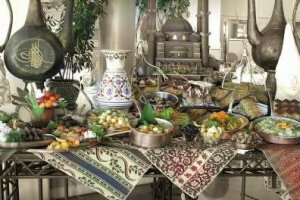 The chief point to be considered is that the foods not be to heavy or rich, but to last us until iftar, the breaking of the fast. Making sure that sahur foods are not too salty will help prevent us from becoming thirsty during the day.